How much "poetic thought" and energy can you fit into 500 square feet? To be honest, I am not sure about the answer to that question, but I have teamed up with The American Poetry Museum to help answer that question. 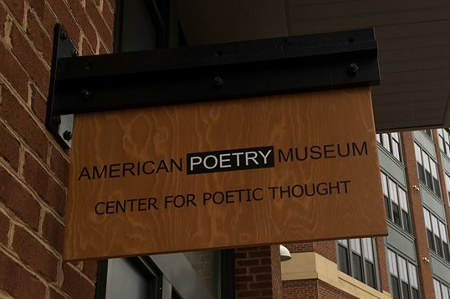 The Center for Poetic Thought is located at 716 Monroe St. NE, Studio #25, part of the new Monroe Street Market in the Brookland neighborhood of NE DC. To cultivate, demonstrate and curate the exhibition of creative work that displays the many ways that “poetry” occurs in American life and beyond. Architect Daniel Libeskind said that every building he has designed and built "has its own poetics." Likewise, a well-known poet and photographer said, "poems do not have a monopoly on Poetry" or "Poetry doesn't care about your poems." Our vision is to be a space for programming that truly captures the poetic rather than simply reporting on it. Although traditional poetry readings and poetry-related events will be a part of our programming, our intention is to create a space that is more than simply another poetry presenting venue. We aim to create a space to demonstrate the many ways in which "poetry" crosses our paths in life and art. This may present itself in the form of music, dance, micro-theater, visual art, and architecture. We believe that poetry is big enough to handle all of that, even in our small and humble home. If you are a poet/scholar/curator/architect/artist/designer/musician/etc and would like to have a space to present your current research or project, drop us a line here and tell us about your project.